Christmas Crafts: Inspired by the Traditions of Scandinavia (Christmas) "Christmas crafts: Inspired by the traditions of Scandinavia"
There are a lot of Christmas crafting books out there and most of them seem to be the same book with slightly different pictures, this books however does have some lovely ideas scattered through it and is very well presented. The focus seems to be more on overall finished style than on how you make each project, with lots of beautiful photos throughout the book to inspire your own individual craft style. Most of the projects are quite simple and the instructions reflect this keeping the detail to a minimum and letting the photos do most of the guiding. Sometimes the projects are almost too simple to really be called projects, especially when you are looking at the sections which have flower arrangements in. 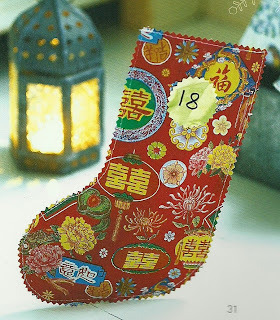 One such project would be the stocking advent calendar (see photo on left), the idea being that you sew presents into wrapping paper in a stocking shape and add numbers to show which day each should be opened. These can then be ripped into easily and look lovely all presented in a nice box at the beginning of December. 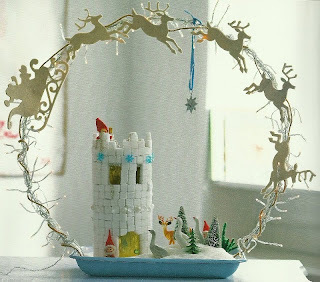 Another of my favourite projects would be this beautiful little snow castle made from sugar cubes. The instructions are that you simply glue the cubes directly to some cardboard tubes, and add glitter and other decorations to finish. Isn't it lovely? This wouldn't be a book that I will be dashing out to buy any time soon, but I do love the photographs and if the nice people at the Library are still talking to me next year then I may well borrow it again then.